Coco OCo: first blogger award!!!! 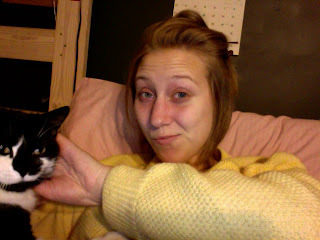 me and my kitty milkshake. not looking my finest, since it's late and im sick and doing homework! thrifted sweater. thank you tremendously Sunshine & Chic! To accept- post it on your blog with a link to the person who gave it to you, pass the award on to around 15 blogs that you think are great, contact the bloggers to let them know they have been chosen for the award. thanks so much for the award, this is awesome!! Awee thankyou so much for the award!! I'm flattered :) You're so sweet. Thank you! I like this photo of you with cat. hahaha thanks! my cat's pretty photogenic, haha.